Super Angel Premium Deluxe Juicer with Surgical Stainless Steel Twin Gears and Extractor Housing, for the purest in the bunch! THIS SUPER ANGEL JUICER IS NEWLY UPGRADED FROM THE ANGEL 8500 FOR USE IN U.S. THE MAJOR PARTS INCLUDING MOTOR, SAFETY SENSORS & CONTROL BOARD ARE UPGRADED AND REINFORCED TO COMPLY WITH U.S. ELECTRICAL SPECIFICATIONS. SURGICAL GRADE 316 STAINLESS STEEL AUGERS (TWIN GEARS) AND EXTRACTING (SCREEN) HOUSING INCLUDED. The Super Angel Juicer is constructed of only the best materials. It features surgical grade stainless steel parts and has the sleekest look of any juicer on the market. With a natural stainless steel finish, this twin gear juicer will provide you with everything you have ever wanted in a juicer. The 82 RPM Twin Gear ensures you will squeeze every last drop of juice possible from your extraction efforts. By keeping the RPM down, this Super Angel Juicer ensures that anyone who uses it gets all the enzymes they were meant to from their food. Motors that run faster (1500 RPM or more) will spit your juice out quickly, but will also lose a lot of the good nutrients inside the food. This Super Angel Premium Deluxe Juicer will give you anywhere from 20 to 30 percent more juice from the same foods than competing juicers. 10 year warranty: Motor, Twin Gears, Switch Panel, Circuit Board, Screen Scraper (Cleaning Knife), Fan, Power Cord, Splash Guard (Screen Cover). No warranty (Wear & Tear) : Cleaning Brush, Wooden Pusher, Pulp Collector, Juice Collector, Fuse, User's Manual. I have owned this juicer for several years now and it continues to perform like the day I bought it. Absolutely no regrets about the price and I have never a mechanical problem. I have juiced a wide variety of fruits and vegetables. Hands down, this is the best juicer made. I've been juicing for 3-4 years and have tried every type on the market from pulp ejection to all types of slow single auger juicers. This by far is the best. Highest yield , easiest to operate and easiest to clean. Prep to clean- up is half the time of the next best machine. It is expensive but I think I will make up the extra cost due to the juicer's efficiency. I bought from Harvest Essentials because of the best price, but now I would buy again because of their great customer service. I dont normally write reviews. But i love this juicer. Easy to use and super easy to clean. Wish i had found this juicer years ago. Love this juicer. It is extremely easy to clean. Best juicer you will ever own! Bought one and within 2 months the welds started leaking around the area where the food goes in. We called Super Angel customer service (not Harvest Essentials) and they asked for pictures. We sent pictures and a video of the leak. Next, they emailed us requesting us to &amp;quot;send the defective part back so they can research it more and if they feel it was their fault they would fix it.� How could a bad weld be anything but their fault? Now we are without the use of the juicer until they &amp;quot;decide if the defective part is their fault!&amp;quot; Unfortunately for us, we bought a second one for our Lake Tahoe home before we had the displeasure of dealing with them. Fortunately, we didn't buy the 3rd one for our Tiburon home from them. Horrible company to deal with and crappy product. Stay away.....plenty of other juicers in the market. delivered before we expected.....this was good. have purchased from H.E. in the past pricing reasonable, produce a dynamo; we drive our juicers hard. will do business with H.E. again. LOVE, LOVE, LOVE This Juicer! I received my Super Angel Premium Deluxe Juicer a little over a week ago and have already used it several times. I love this juicer!!! It arrived in perfect condition, when the company said it would. As soon as I unpacked, cleaned, and assembled it, I began juicing. It was very easy to put together--a snap after my Greenstar juicer! It does take a little pressure to put carrots, beets, and other hard veggies through it, but it's not that difficult. I'm 65 and do it with ease. The juice tastes amazing, and it does keep well. I kept some veggie juice in the fridge for about 36 hours and it tasted as if it had just come through the juicer. I had been using a juice press with my Greenstar juicer, but the time involved just made it very impractical. There is very little pulp with my Angel, and what pulp remains is very dry compared to other juicers--it is very close to being as dry as that remaining on the juice press. I believe the yield is actually better, though, because there is less pulp remaining. So far it has done excellent work on carrots, beets, celery, apples, kale, chard, grapes, and ginger. Did I mention how easy clean-up is compared to my other juicers? I also had a Breville Juice Fountain--a centrifugal juicer--and clean-up time for my Angel is much faster. Compared to the Greenstar and juice press, clean-up is done in about 15% of the time!!! If you can possibly afford this juicer, it is definitely the one to buy. I received my Super Angel premium deluxe today and immediately un-boxed it, looked at the manual and started juicing. I did not have any wheat grass so I juiced some chard, spinach, kale, arugala, along with one carrot, one small beet, and two handfulls of blue berries. Well was I amazed!! The juice quality and yield from a small batch of veggies was awesome! The taste was intense in a very good way, so fresh and vibrant. I also use a Tribest Slowstar for harder veggies but the Angel outperformed it tremendously. I (as well as my wife !) was very hesitant about spending the $$ for this juicer but I am absolutely impressed and pleased by the results! The unit is exceptional quality with the stainless steel and very easy to clean! If you are serious about a juicer that will last and deliver exceptional quality over the longterm I highly recommend the Super Angel! I have planted my first batch of wheat grass and am looking forward to juicing it in the Super Angel in about a week. Great product!! 10 stars! Quality in every way. The all stainless motor, body and attachments are strong. Unit very easy to clean and keep sanitary. Quick assembly. Great health investment. This Juicer is out of this world. I was juicing with an Omega NC900HDC and I loved the results. However the first thing I noticed on the Angel Juicer was the amount of yield it produces. I have to reduce the portions now compared to my old Omega. As for the taste its incredible. The taste is extremely saturated. Its like if I would to make an association of Coffee, you have american coffee that you pour a cup of coffee and little milk/cream vs latte that is a shot of coffee and cup of steam milk. Well this Angel Juicer is like that Espresso machine it saturates the juice and you get more minerals, vitamins from this quality of juicer. Its worth every every penny. This juicer is simply amazing. I have had other well known brands and nothing works as beautifully as the Angel does. If you juice alot of leafy greens nothing compares to this, and cleaning is a breeze! Quiet, easy clean, dry pulp, surprising amount of juice produced. This machine is top quality and built to last. We are very pleased with it\'s performance. This is the third juicer I have owned. The first two were decent enough Omega Juicers but compared to this Angel Juicer they are not really in the same league. Of course the Angel Juicer is much more expensive so it is not surprising but take it from me, if you can afford this baby don't hesitate since it appears to be worth the extra $$$. Whereas the Omega Juicers are certainly usable it has a single auger and many of the parts including the auger are made of plastic which shows wear over time and doesn't extract as much juice as the twin auger design. 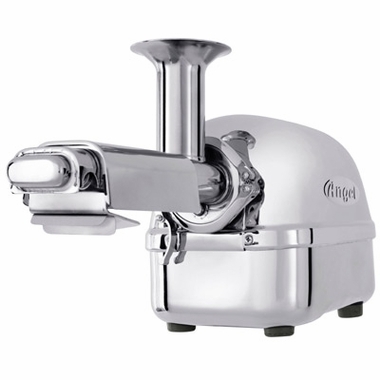 The angel juicer is made entirely of stainless steel (in my case surgical grade stainless steel) that looks like it will last a very long time and it is gorgeous. Cleaning is also a snap so if you are serious about juicing and have the $$$ to purchase one of these don't hesitate you won't likely ever need to purchase another juicer ever.